There are a couple schools of thought on the importance of grip and how firm or loose it should be. In Bullseyes Don't Shoot Back, Rex Applegate says that a shooter should have a convulsive grip. In both Fencing and Kendo, it is suggested that the grasp be firm enough to control the blade but not overpoweringly strong. In the fencing arts, disarming your opponent is definitely a plus. As such, swords are often struck with great force. Yet, the grip that is recommended is firm but, not overly strong. We tend to side with the fencers on this one. You should be able to control the weapon but not grasp it so tightly that you throw shots or become fatigued. 1. The support hand should cover as much area as possible. 2. Limit gaps between the pistol grip and the hands. 3. Thumbs should not cross over each other. 4. Watch for interference. If one of the thumbs rests on the slide release, the slide may not lock back on an empty magazine. 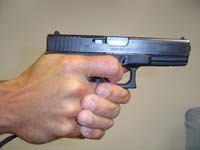 If one of the thumbs crosses over behind the slide, it may cause “slide bite” and failure of the weapon to cycle properly. 5. Watch for week wrists or soft grip. If the grasp is too light or weak, the weapon recoil is not controlled and the weapon may not cycle properly. Depending on the size of the weapon and the size of the shooters hand, the trigger finger may not rest on the trigger in the same manner for all shooters. Watch for too much or too little trigger finger. If the weapon in question is an issued firearm there may be little you can do to correct this problem. In this case, individual attention will be needed to help the shooter find a natural grip that allows for good trigger control. 1. 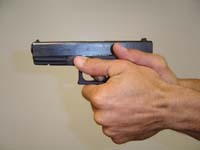 Milking or clutching: this occurs when the shooter applies more force to the pistol grip as the trigger is being pulled. This can cause a barrel to shift away from the point of aim at the most critical point, just as the shot breaks. 2. Too much support hand: This is when the shooter has too much of the support hand wrapped around the front of the firing hand this can result in the pulling of the shot to the non-firing side. 3. Sympathetic support hand squeeze. When the shot is fired the support hand inadvertently squeezes at the same time. This will also result in pulling the shot to the non-firing side. Because all shooters are different it is very difficult to come up with a "one size fits all" answer. Evaluate the shooter's performance and make corrections only as needed.